Here’s one for the Irony Department. This weekend George Zimmerman’s painting sold for $100,099.00 on eBay, the very same weekend that artist Michael D’Antuono’s “A Tale of Two Hoodies” was removed by the online auction company. 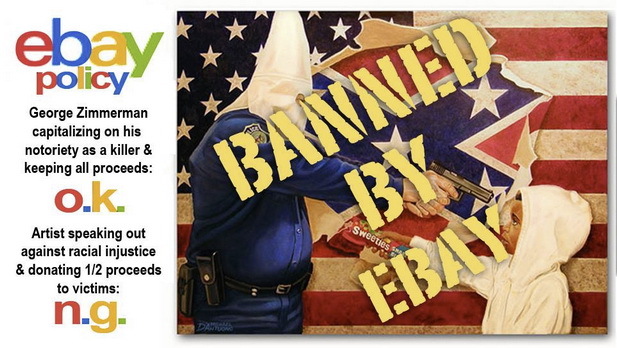 I’m sad to announce that ebay removed my “A Tale Of Two Hoodies” auction from their site. They allowed George Zimmerman to profit from his crime, yet I was denied the opportunity to speak out against racism & help victims. As the bidding started to gain momentum, passing the $25,000 mark, they took it off, deeming my auction “hateful and discriminatory.” If their stance seems wrong to you, feel free to share. On the same day that George Zimmerman closed his ebay auction of his painting for over $100,000, the online auctioneers removed my anti-racism painting inspired by the Zimmerman case, “A Tale Of Two Hoodies” for being “hateful or discriminatory.” While Zimmerman was allowed to capitalize on his ill-gotten notoriety, I was denied the opportunity to raise funds to help the very foundation named in honor of Zimmerman’s victim. The painting in question was completed shortly after the Trayvon Martin murder. it was meant to symbolize the travesty of racially profiling innocent children and the affect prejudice has on policy. The bidding was gaining momentum quickly passing the $25,000 mark on day two of a scheduled seven day auction when bay decided to pull the plug. I feel ebay failed to see the forest from the trees on this one. In my opinion, any policy that allows a murderer to profit from his crime, but deems art that speaks out against racial injustice and benefits it’s victims ‘hateful and discriminatory’ needs to be reevaluated. In light of recent developments, interested parties can send bids for the piece directly to me at Michael@ArtandResponse.com. Once the reserve is met, I will donate half of the proceeds to The Trayvon Martin Foundation.